Tried to submit but got rejected, please help me to improve this image. trying to show an medieval army arriving at the watchtowers. thanks in advance. thanks for the reply will do what you said. but i need to know do the boats/ships look too simple? i mean they should more huge and detailed,right? If these towers are medieval, then they should have more of a grey stone look to them, and add some snow on the towers. Well I think your image needs a lot of work. -The sky is boring. I would just use a photograph of real clouds. -Your boats aren't very interesting. The sails should be square, and the curly things on the bow and stern don't add much. Google "carrack" or "caravel" for some reference on what a nice medieval ship would look like. -Its impossible to determine the scale of the scene. Maybe add some trees at the base of the mountain for comparison. -I would image that only the summit of the mountain would have snow on it. Or if the whole mountain was in freezing conditions, the lake would have ice on it. -The stone blocks on the towers are way to big, and the color of the stone should be a bit closer to the mountain. I would think that the towers should have snow on them as well. Try entering “Helm’s Deep Lord of the Rings”, or “minas tirith Lord of the Rings” into google for some reference images. Also look up some images of real castles, like “chateau de puylaurens” or “edinburgh castle”. 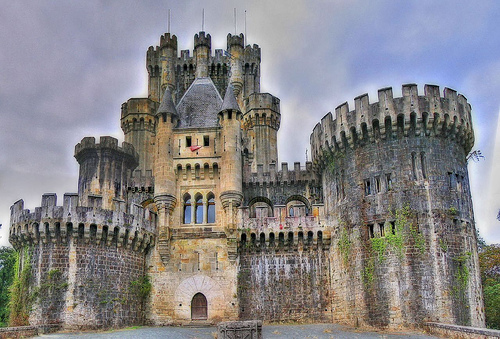 I also found some nice images by googling “fantasy castle”. i changed the mountains to full snow, changed the water color, added ice packs in the water(or whatever they are called), grayed and more tilled the towers texture. might not be noticeable but added a few trees. I hate to say this, but the picture is different, but not really a big improvement. The image lack details. The texture of the tower looks like having just a bump map applied. It does not work these day. Just to give you some what would be expected of a wall texture of a medieval castle, courtesy of Google. Also the snow doesn’t work, in my view, the cliff are too steep to trap any significant snow, & the snow are too even. back to the tower, its too simple, & left a lot of question unanswer, like how did people get into the towers, & what is its purpose. I made a quick paintover to give you an idea the minimal amount of details to be expected. In my paintover, its clear that you can enter the castle via waterway, & the tower may act as some sort of watch tower. YOu can add some miniture people to give it a sense of life. Would be more dramatic is the scene is sunst or evening, or some snowfall. Thanks PKD, i was thinking of converting it into a fortress. regarding the changes i was gonna do it one by one. i followed PKD’s advice and made this. added ships and snow on towers. comments please. I think it would help to add a picture of a real sky as your background. i know but wanted to create clouds in max, but i think max doesn’t have that i mean multicolored clouds options(not like simple with volume fog and atmospheric apparatus). i added a main tower and did the door(hid the ships cause the scene became heavy). The entrance looks boring. I likes first ideas prior to this one. I think you need to look for a book about architectural elements, and add some things, like counterforts and so on. I think last PKD suggestion was interesting or something similar. ya i know but i am adding elements one by one and getting less time to work. And what do you mean by “entrance is boring”?, meaning there should be something like PKD’s paintover? The wall itself is boring. Flying bridges look like an interesting idea. By the way, I think the idea and the general approach is interesting, and there is a mood in it, I just pick the parts which are most important I see. yes i would place people later and will work on the wall, thanks. but what do you mean by flying bridge?